The Institute of Medical Quality (IMQ) is a valued OOSS Resource Partner. Resource Partners provide products and services of interest to OOSS members. These partners support OOSS through their financial and in-kind contributions. Learn more about the OOSS Partner Program. In January 1996, the California Medical Association launched a new not-for-profit subsidiary, the Institute for Medical Quality (IMQ), to help improve the quality of care delivered to patients in California. From the beginning, IMQ was designed to be different from other health-care-quality organizations in that it would make providing quality care easier and eliminate, rather than create, barriers to doing so. What makes IMQ special is its heavy emphasis on education, counseling, and direct involvement of practicing physicians. Some, but not all, IMQ programs involve surveys of facilities and medical practices. Each program is carefully developed and continuously updated by physicians whose practices are similar to those they are evaluating or advising. They make every effort to keep materials relevant, current, and meaningful, and to discard components that may be outdated or unnecessarily burdensome. IMQ is a 501(c)3 corporation. In the course of this partnership, IMQ has demonstrated a strong commitment to being an accreditation resource partner and entity of choice for members of the OOSS community. 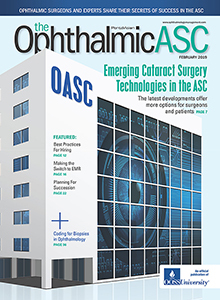 By understanding the ophthalmic ASC and offering surveys that meet the Medicare requirements, IMQ seeks to deliver outstanding customer service before, during, and after the survey and, working with OOSS, to further develop a model process and attendant resources for the ophthalmic ASC community. 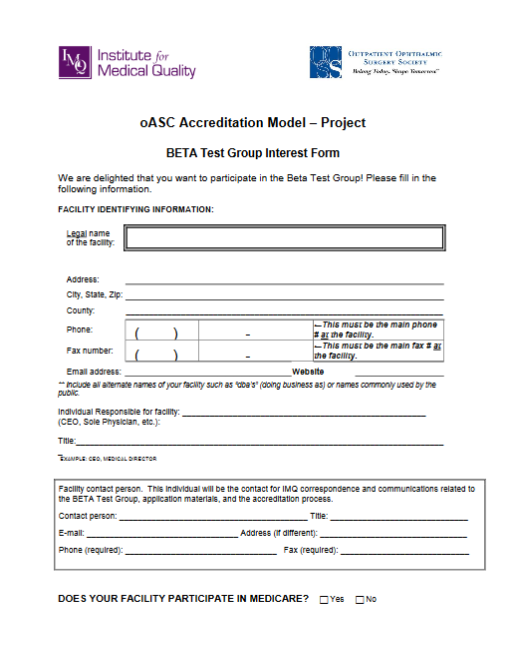 For details about this project and to express interest in participating in the associated BETA test, which is open to OOSS member facilities only, CLICK HERE. Or download, print, complete, and submit the following form to Victoria Samper, VP Ambulatory Accreditation (vsamper@imq.org or 415-882-5173).